In the spring we became the only known conference and events venue in the capital to embrace the principles of leading chefs Jamie Oliver and Hugh Fearnley-Whittingstall in their campaigns to put an end to needless food waste and promote ‘wonky veg’. After a hectic summer, September saw us enter the glamorous world of high fashion when we hosted design duo Vin + Omi’s fabulous fashion show during London Fashion Week. The show featured a host of celebrity models and we even made it onto the pages of Vogue (albeit the online edition!) as a result. Square Meal’s Venues & Events magazine covered the event in a fantastic 4-page feature. In September, we also welcomed L’Oreal to the venue for the first time and were delighted to pick up some beauty tips during their Lancôme roadshow. Congress Centre remains a popular film location due to its mid-century modern aesthetic and in October scenes from Sky’s new political drama, Guerilla, starring Idris Elba were filmed here, along with part of the film adaptation of Agatha Christie’s Crooked House starring Max Irons, Terence Stamp, Glenn Close and Gillian Anderson. Over the course of the year we’ve also welcomed many associations to the venue including The Association of Online Publishers who held a 2-day member event with us in October. We’re currently enjoying the festive season and look forward to a well-earned rest between Christmas and New Year when the venue will be closed. 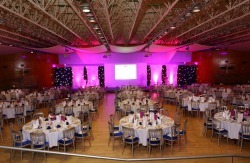 If you haven’t yet been to Congress Centre, you can arrange a personal tour of the venue by calling 020 7467 1318. Wishing you a very merry Christmas and a happy and peaceful 2017!